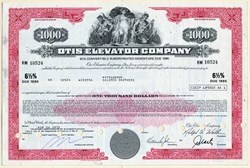 Beautifully engraved certificate from the Otis Elevator Company issued no later than 1972. This historic document was printed by the American Banknote Company and has an ornate border around it with a vignette of two allegorical men sitting beside an allegorical woman with her arms spread. This item has the printed signatures of the Company�s Treasurer and Secretary and is over 38 years old. Otis Elevator Co., a wholly-owned subsidiary of United Technologies Corporation, is the world's largest manufacturer installer, and servicer of elevators, escalators, moving walkways and other horizontal transportation systems.